The wellness hub will be open to occupants of 435 Bourke Street and the broader community, and will feature “a retail offering, flexible spaces that promote wellbeing, plus a rooftop garden retail offering”. 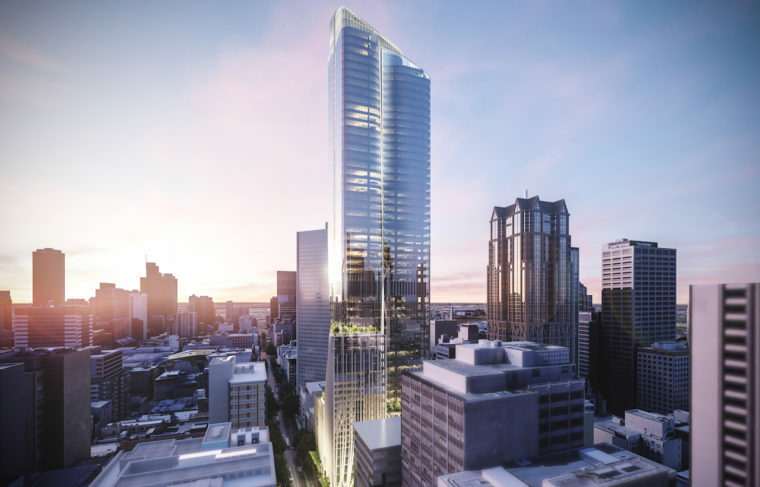 Designed by architecture firm Bates Smart, the new $1 billion commercial development with around 64,500 square metres of net lettable office space is targeting a WELL Platinum rating. When designing the building, the firm looked to service more than just the physical health of its occupants. “As the architect, we see the concept of wellness in the design of buildings and workspaces as fundamental to achieving happiness, health, engagement and equality of the building’s inhabitants,” Bates Smart director Cian Davis said. The pursuit of “humanistic architecture” in this instance involves six different landscaped terraces to provide places for people to gather and socialise outdoors. There will also be “vertical villages” informed by biophilic design principles between office levels to provide “connectivity between floors”. There will also be room for 585 bikes and premium end of trip facilities. Further, the tower’s sculptural form is designed to maximise access to sunlight in communal spaces and optimise views of Melbourne’s landmarks. Mr Davis sees the focus on wellness in commercial development as a direct response to the evolving nature of work. “The way we work is rapidly evolving towards an environment defined by technology, globalism and the automation of systems, and we are seeing organisations place a greater emphasis on creativity, collaboration and design thinking,” he said. The proposed development is also aiming high on sustainability. The developers are targeting a NABERS Energy Office Base Building of 5.5 stars and a minimum 5 star Green Star Design & As-built V1.2 certification. The tower’s sculptural form also boosts its sustainability credentials. Broken into four differentiated bundles at varying heights, the design “greatly improves the structural performance of the tower, reducing the effect of wind on the core, allowing an efficient structural solution,” Mr Davis said. Standout sustainability features include a closed cavity façade system: a double skin façade where the cavity between the inner and the outer skin is completely sealed. This highly energy efficient system will be installed on the northern and western facades. Waste from the building will also by disposed of thoughtfully and a macerator for food waste installed. The plans also take into account the amenity of the surrounding landscape. “Significant future urban renewal projects in the surrounding area mean this site will form part of a new centre point in the Hoddle Grid and will create a new and exciting standard for commercial office projects in Melbourne,” Cbus Property chief executive officer Adrian Pozzo said. The planning application for the development was lodged on Thursday 20 December. Construction is expected to commence this year.